This blog celebrates Trustees Week. Trustees have many responsibilities and significant power to guide their charity for good or ill. Occasionally circumstances become so stressful, particularly during a stock market panic, that long held strategies can be quickly abandoned. In one scenario trustees might have instructed their investment manager with a high earning but high risk mandate, only to find that it falls by 30% (so far). Not knowing how much further it will fall, they change their mandate to one focussed on preserving the remaining capital, usually by selling equities and holding cash. Too often the market then recovers, but the portfolio doesn’t. Only trustees can do this. We should always remember that being a trustee is very rewarding but can involve a variety of stressful situations: think of safeguarding, expenditure decisions, data and of course investing. It is not as simple as rolling some dice and hoping for the best outcome, as it is rarely that simple. The key is to be prepared and rehearse these situations as far as possible – which is a good use of the Risk Register. Where organisations have mission critical components it is important to make sure they are resilient and well supported. It is up to senior staff to make sure that their trustees are properly supported so they can exercise their duties and responsibilities as effectively as possible. 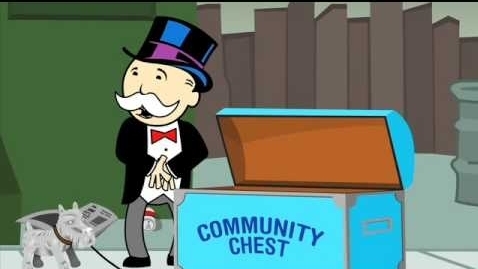 When the Community Chest is empty? We know what would happen if every player in a game of Monopoly was given a huge amount of extra money by the bank in the middle of the game. Assets would go up in value, but rent and mortgage values would not change because they are set out on the Title Deed card for each property and can’t be changed. In this new situation staying in Mayfair and Park Lane hotels had become very affordable because everyone had a lot of cash. The only people struggling were those that had bought too many properties at expensive prices, had less luck than others, and therefore less cash. When they sold their properties they still received inflated prices. What happens if the situation is reversed and the bank decides that it wants its money back again? Things would be very different: asset prices would fall, very quickly if the money was to be returned in one tranche, and players would no longer have a fat pile of cash as a cushion. Many would go bankrupt much faster, and these forced sellers would trade in their properties for distressed prices (or even the mortgage value), realising great losses. The only thing that will save the game will be the discovery of another source of money to replace the money being withdrawn by the bank. What could do that? The plan is for it to be global economic growth but it needs to be a large number. Will enough be available when it is needed? Can we rely on Chance or Community Chest? No one knows. While they may have some discretion, Trustees with assets and contracts need to have sufficient liquidity to meet their ongoing obligations.